As Des Thompson and Phil Whitfield wrote at the conclusion of their account for the 1988-91 Breeding Atlas, “The Arctic affinities of the British Dotterel, its beauty, its rarity and its likely sensitivity to habitat and climate change secure its place as one of our most fascinating breeding birds”. Well-documented stories of females laying clutches in Scotland, to be brooded by their male partners, and then flying on to Norway to lay second clutches add an air of mystery too. The population estimate of 423 breeding male Dotterel in 2011 represents a decline of 43% since 1999, when the comparable total was 747 pairs, and of 57% since 1987/1988 (981 pairs). All regions except the West Highlands had lower numbers in 2011 than in 1999, with the core area of the East Highlands (the Grampians east of the A9) experiencing a significant decrease of 32% since 1999 and 56% since 1987. This massif has become increasingly important, with 60% of the pairs in what amounts to 30% of the potential breeding habitat for Scottish Dotterel. 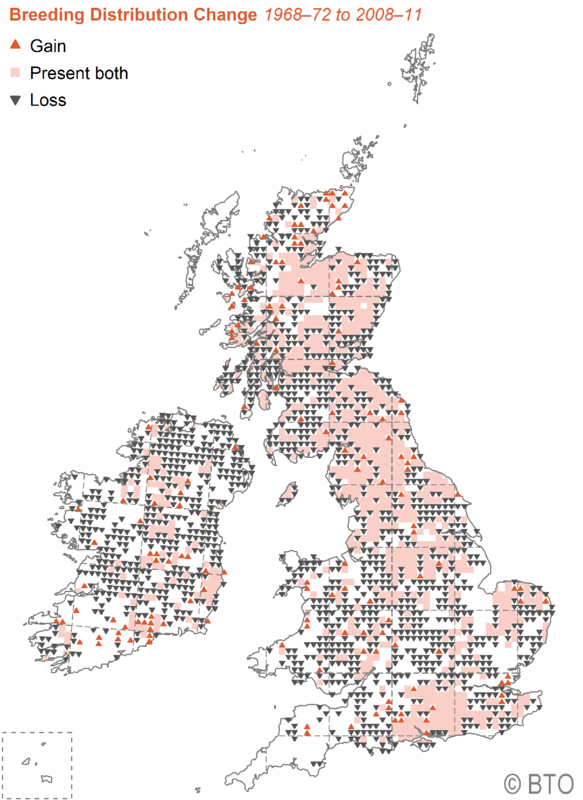 No Dotterel were recorded outwith Scotland during the systematic national survey but Bird Atlas 2007-11 fieldwork did add a record from Northern England. In the absence of annual monitoring, a national survey can only provide a snapshot for a species. However, information gathered during the four summers of the Bird Atlas project and as part of an ongoing detailed study suggests that the results for 2011 are representative of the current UK Dotterel population – and that the declines are therefore very much real. Large-scale surveys of Dotterel are difficult, due to the remoteness of many of their breeding sites, and monitoring elsewhere across their European breeding range tends to be based on visits to particular sites or using transects. Given the plasticity shown by the females – including an ability to nest in two countries in one year – changes in apparent numbers could potentially reflect the fact that birds breed further north in some springs than in others. The best series of data come from Swedish Lapland, where Svensson & Anderson reported no changes in the population over the period 1972 to 2011. In, Finland, Pulliainen & Saari observed that most females left their study area after egg-laying and hypothesised that this was in order to secure more mates further north. Lucker et al. have found evidence for higher rates of shared incubation by females at the more northern extent of the species’ breeding range than those breeding further south, providing some evidence to support this hypothesis. Saari had previously estimated the Finnish population to be 90% less than in the early 1900s and suggested that hunting in early 20th century and overgrazing by reindeer may have been to blame. Since the 1960s, the tree line has advanced and large areas of the mountain heath are now covered by scattered Scots Pines, making the habitat largely unsuitable for Dotterel. 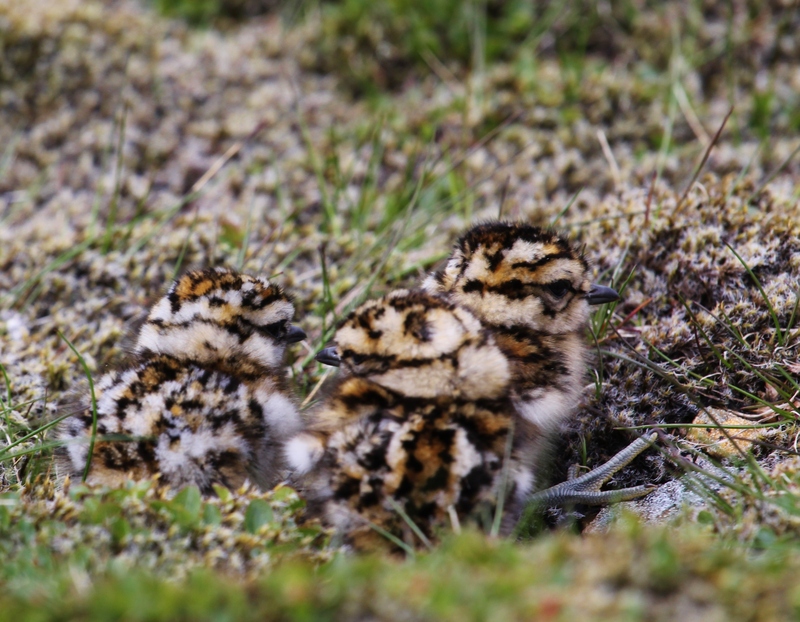 Similar processes, associated with warmer conditions, could have major, negative impacts the number of Dotterel breeding in Scotland. Is the SPA network working for Dotterel in Scotland? The designation of Special Protected Areas (SPA), based on the results of the 1987/88 survey has been a key tool in the efforts to conserve Dotterels in Scotland. This network of montane sites has helped to provide a focus for research funding and planning considerations. Encouragingly, SPAs have supported between 50% and 60% of the population since designation. The decline in numbers of Dotterel within and outwith the SPA network is of concern, but in terms of site occupancy, sites in SPA/SSSIs were more likely to be occupied than those outside the protected area network. Protected area designation has been shown to be good for a group of northern species at the trailing edge of their distribution in the UK, although this effect decreased at higher latitudes and altitudes (Gillingham et al. 2015). The well-referenced, discussion section of the paper looks at the potential reasons for the changes to Dotterel populations and assesses the available evidence. Habitat change in the high mountains: Racomitrium moss heath has been shown to provide important foraging opportunities for Dotterel of all ages; this is a habitat that has been in a long-term decline over the last half century. Studies have outlined how overgrazing and levels of atmospheric nitrogen interact, resulting in changes to the composition and extent of montane heaths. A frequent prey of both adult and juvenile Dotterel is Tipulid (cranefly) larvae which require dense mats of moss vegetation. Changes in composition and extent of Racomitrium heath could result in reduced prey availability, potentially affecting settlement decisions and breeding success for Dotterel. Predation in the breeding season: Predation of Dotterel eggs by Ravens can cause localised declines, and lower return rates have been reported for adult male Dotterel after clutch loss by predation. The period of decline in Dotterel is coincident with an increase in range and abundance, of Ravens in Scotland. Although previous work has found no significant negative associations between Raven numbers and upland wader populations, this interaction may well warrant further investigation. Disturbance: There is little strong evidence for widespread effects of increased visitor numbers, despite negative impacts of such activities on heath condition. Pressures in wintering areas: Pesticide use and hunting on the wintering grounds, North Africa and Spain, have been suggested as possible factors in the decline. More attractive conditions further north: Upland species, such as Dotterel, are cold-adapted and may well find northerly areas more conducive to breeding. Without a flyway approach to Dotterel monitoring it is not possible to distinguish between a northerly shift in the breeding area of Dotterel and population-scale declines. 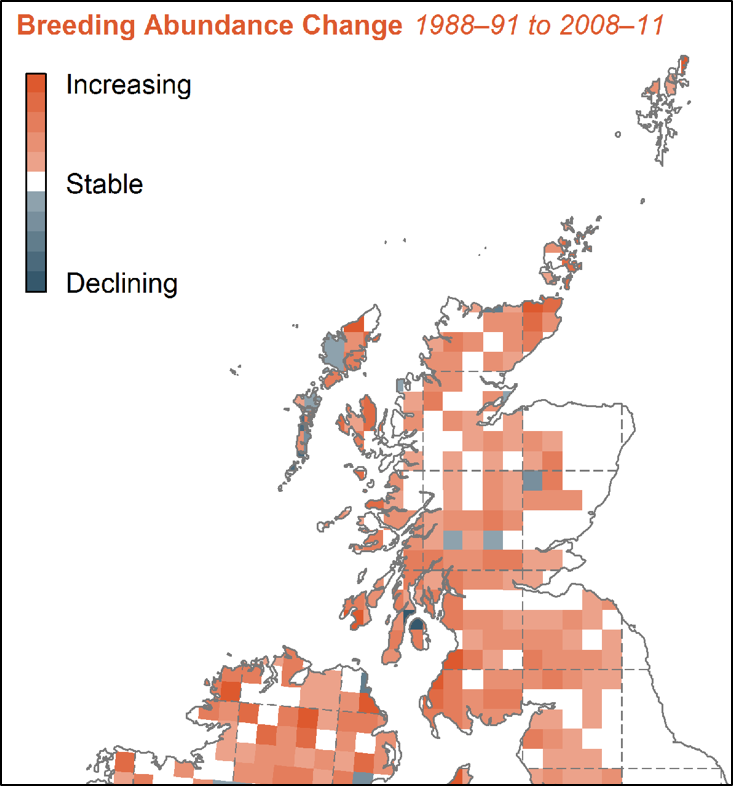 The 2011 Dotterel survey clearly shows the decline in numbers of Dotterel breeding in the UK and contraction to core sites in the East and Central Highlands. Further, detailed work is required to understand the mechanisms driving the observed population trends, which may well involve studies in wintering areas and migration hot-spots, as well as a mixture of ecological research and ongoing monitoring in the mountains of Scotland. The 2011 Dotterel survey has provided a spring-board for detailed research by Alistair Baxter, which is being written up as part of his PhD at the University of Aberdeen. 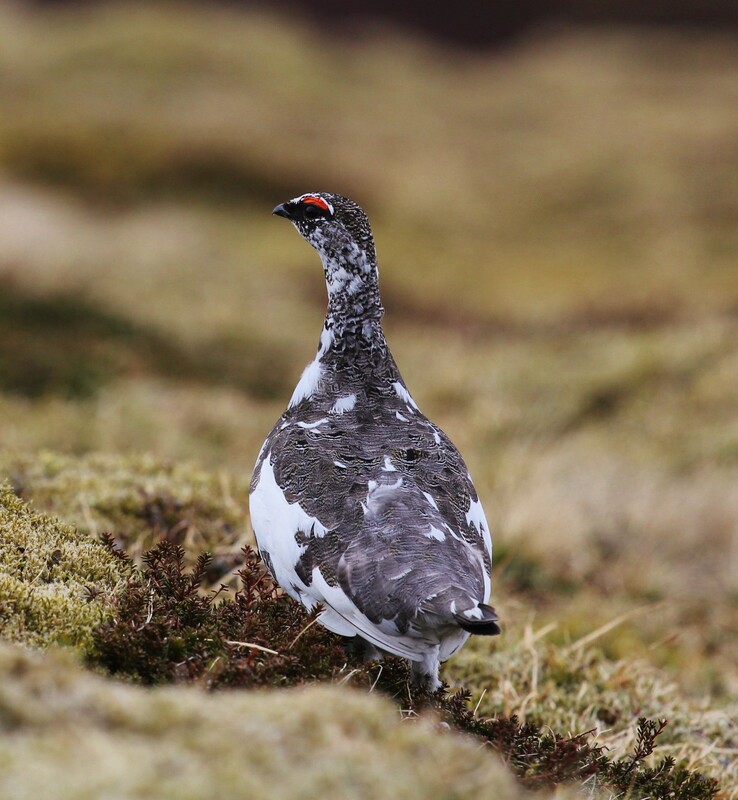 By repeating studies carried out during the 1980s by SNH, he hopes to see whether changes in habitat availability, habitat quality and invertebrate abundance can help to explain the decline in numbers in the last thirty or so years. 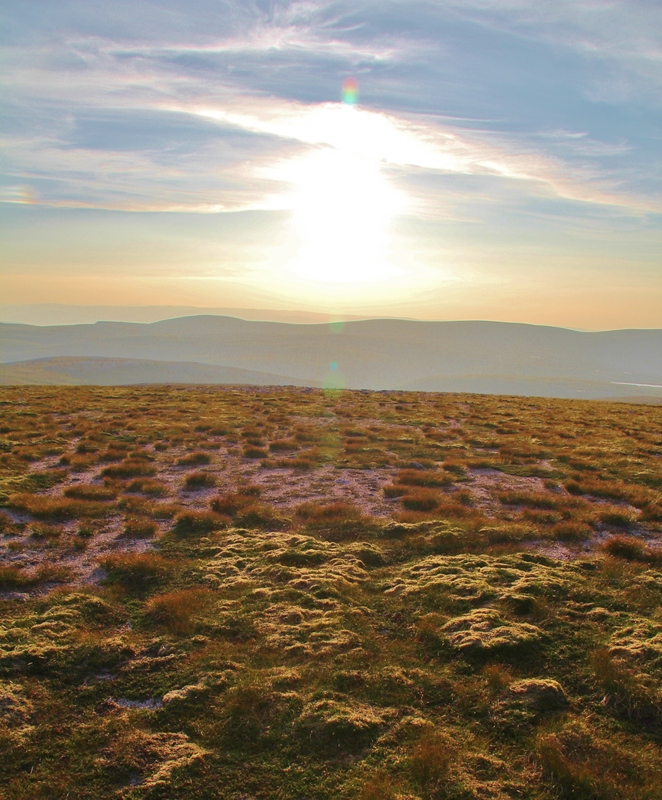 Given how much effort has to go into any survey of upland species and the relative infrequency of national surveys, it is great that two recent initiatives are making the most of the calories burned to climb our highest peaks. Many volunteers involved in the annual Breeding Bird Survey of upland squares now add an adjacent square to the original, randomly-selected plots, in order to increase the sample size in these sparsely populated but special bird areas. Another valuable contribution is being made by mountain-lovers who know their birds and who are now contributing to the BTO Scotland led “What’s Up?” project. This focuses on species that are sensitive to climate change and disturbance, such as Ptarmigan, Snow Bunting and Dotterel. In an era of ever tightening budgets, it is unclear when it might be possible to organise another national survey for Dotterel. Let’s hope that, until then, “What’s Up?” can help to alert us to distribution changes and that annual surveys of key sites might provide indications of national population changes. Dotterel was moved onto the red list of species of conservation concern on 3 December 2015. To help to take the pressure off declining and now red-listed British-breeding Woodcock, many estates are already delaying the start of the Woodcock shooting season. How might this make a difference? This is a modified version of an article published in Shooting Times on 30 Sep 2015. There are updates at the end, reflecting changing advice provided by the Game & Wildlife Conservation Trust. Each autumn, the British population of Woodcocks is swamped by the arrival of up to a million birds, returning from northern Europe and Scandinavia. The exact timing of their migration is very much influenced by weather, with birds crossing the North Sea as early as October or as late as December. The numbers each year are thought to vary markedly, reflecting peaks and troughs in the size of the European breeding population, annual chick production, the amount of frost and snow on the other side of the North Sea and the timing of periods of cold weather. 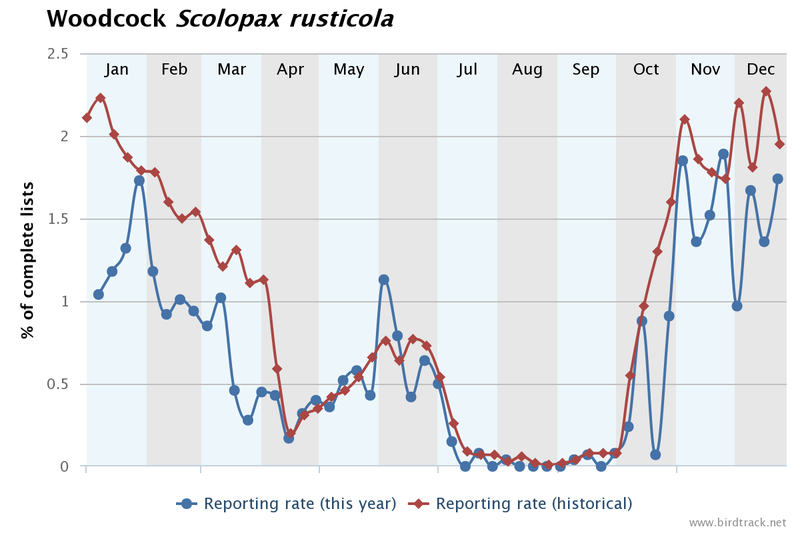 A quick look at the bag index for Woodcock, produced by the Game & Wildlife Conservation Trust (GWCT), shows annual variation in the numbers shot each winter but no downwards trend. Hunting appears to be sustainable (but see note at the bottom giving advice from GWCT about shooting in winter of 2017/18). Unfortunately, there is a problem; British-breeding Woodcock are in serious decline and there is no way to differentiate between a local bird and one from continental Europe. As the GWCT Woodcock tracking project has shown, birds share the same woodland habitats during winter months. Mara and Jack, for instance, two birds caught in March 2014 on Islay, have very different annual stories to tell, with Mara breeding locally and Jack migrating to Russia. Bird Atlas 2007-11, published by the British Trust for Ornithology (BTO), confirmed that our Woodcock are in trouble. Between 1968-72 and 1988-91, the number of 10×10 km atlas squares where Woodcock were present fell from 1439 to 917, representing a decline of 36%. By 2008-11, the number was down to 632, a further drop of 31%. In the 1968-72 Atlas, Woodcocks were generally widespread, with birds absent only from parts of southwest England and Wales and easy to find from the North Midlands through to northern Scotland, other than in the highest mountains. Fragmentation that was becoming apparent in 1988-91 was glaringly obvious in 2008-11, especially in the south and west. In Ireland the situation, if anything, looked worse. Bird Atlas 2007-11, published by the BTO, in association with the Scottish Ornithologists’ Club and BirdWatch Ireland, shows that breeding Woodcock are disappearing from southern and western Britain, as well as from Ireland. Downwards pointing black arrows show losses. Early results being contributed to the Bird Atlas 2007-11 project confirmed that there was an urgent need for a special Woodcock survey, to try to assess numbers as well as distribution, and this was organised for the summer of 2013. The GWCT and the BTO wanted to replicate the survey they had organised in 2003, which suggested that the breeding population across Scotland, Wales and England included just over 78,000 territorial males. Andrew Hoodless of GWCT has shown that the number of Woodcocks observed during a standard evening watch period provides a good index of local abundance. The national survey called for the deployment of hundreds of birdwatchers, who were asked to visit chosen sites, many of which had been visited ten years previously. Standing at dusk and listening to the distinctive roding calls of male Woodcocks, as they patrol the boundaries of their territories, provides magical moments for lucky birdwatchers. However, the chance of success in many parts of the country was far lower in 2013 than it had been in 2003. A paper, with a full regional analysis was published in 2015, revealing an estimated fall in numbers of 30%, to just over 55,000 roding males. As suggested by the Atlas distribution maps, percentage losses were higher in Wales and England than in Scotland. The main aim of the 2013 Woodcock survey was to assess the population, rather than to understand the causes of decline, but it is interesting to note that there were smaller losses in the largest areas of woodland. More detailed studies have suggested that larger woods may offer a greater diversity of habitats and damper micro-climates in which to feed. Booming deer populations are having major effects on a lot of woodlands; by browsing the vegetation they can open up the understorey, thereby removing nesting habitat and drying out soils. There are probably several factors driving down the breeding population and it has been suggested that recreational disturbance and over-winter hunting of resident birds could each be playing a part in declines. Changes to the hunting season? BirdTrack is coordinated by the BTO, in partnership with RSPB, BirdWatch Ireland, the Scottish Ornithologists’ Club and the Welsh Ornithological Society. These lists provide fascinating information about the timing of migration, annual breeding patterns and species’ abundance. See www.birdtrack.net to learn more. Although the main pressures may well occur during the summer months, one way to help British breeding Woodcock may be to change the start of the shooting season. The season currently opens on 1 September in Scotland and 1 October across the rest of the UK. Looking at BirdTrack data, collected from species lists sent in by thousands of birdwatchers across Britain & Ireland, it is clear that there are virtually no continental Woodcock in these islands during September and few until at least the second half of October. In the graph alongside, the red line shows average rates of occurrence on birdwatchers’ lists. The blue line for 2014 indicated a pulse of arrivals in early October, largely as observed by birdwatchers on the east coast. These birds will have moved inland and disappeared into woodland and farmland. The main arrival in this particular year appears to have been in late October with later spikes in the graph suggesting further bursts of east coast activity in November and December. The BirdTrack pattern will come as little surprise to gamekeepers and shoot-owners, many of whom already restrict Woodcock shooting to the winter months, in order to minimise losses of local, resident birds. GWCT scientists have been encouraging restraint in the autumn months for some while. Now, having analysed the results of the GWCT/BTO 2013 Woodcock survey, and shown a further decline of nearly a third in just ten years, they are researching the potential impact of shooting on resident birds. This will include an assessment of whether a formal change to the timing of the hunting season for Woodcock is required, in order to add an extra level of protection to resident birds. Woodcocks are severely affected by cold weather. Research by GWCT suggest that Woodcock start to suffer when the ground has been frozen for relatively short periods of time. They propose restraint after four days of freezing conditions, with birds being given a recovery period of seven days once a thaw commences. There’s more in this blog here and the paper can be found here. The space-invader cries of displaying Lapwings are welcome signs of spring across much of Britain’s countryside and losses of this iconic species, especially in lowland England, have been well chronicled. Conservation organisations, and the RSPB in particular, are successfully supporting breeding numbers on nature reserves but how can their interventions be replicated on working farms, without flooding fields and installing fox-proof electric fences? Dr Jen Smart of the RSPB Centre for Conservation Science and Professor Jenny Gill of the University of East Anglia have been studying breeding waders on RSPB Reserves in the Norfolk Broads for over ten years, but more recently they have extended their wader research into commercially managed grasslands across Norfolk and Suffolk, using funding from Defra. At the February 2015 ‘Foxycology’ conference, Dr Smart explained how the RSPB is trying to manage the conflict between the conservation of ground-nesting birds and foxes. The RSPB does not rule out shooting as a protection measure – there’s active fox control in the study site – but prefers to adopt non-lethal solutions to the predation problem. One answer may be to provide foxes with ‘convenience food’, in the form of mice and voles. If it’s easier to find mice and voles than wader nests and chicks then perhaps that’s what foxes will do? Predation is a natural process but rates can be severely skewed by the way that the countryside is managed, especially when the balance of predator and prey is disturbed. Many predators are opportunists, with species such as foxes, crows, gulls and raptors switching their activities to take advantage of local food availability. Seasonal abundance of food resources can affect both survival and productivity. An inexperienced young fox must have a better chance of surviving the winter if he is presented with a generous supply of released pheasants, whilst a vixen, trying to raise a litter of cubs, will find easy pickings in a gull colony. In the same way, a nature reserve that is full of nesting waders will often attract foxes during the breeding season. 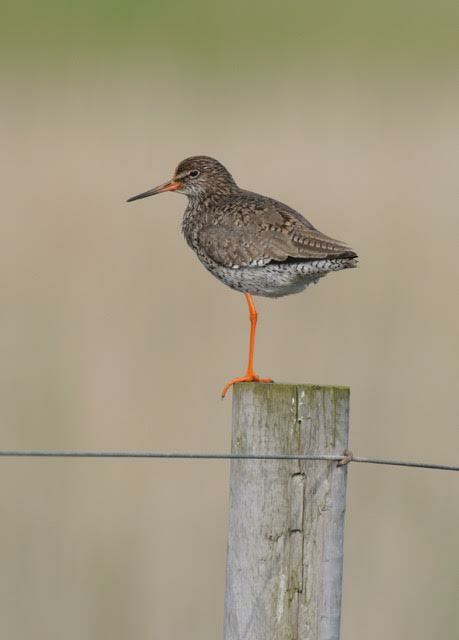 The RSPB has become very good at increasing populations of wading birds breeding on their lowland nature reserves but staff are frequently frustrated by the low numbers of young birds that survive through to fledging in some years. Adding water to the landscape, in the form of pools and ditches, attracts high densities of breeding waders, as these wet features provide insect-rich places to which adults can take their chicks. The RSPB/UEA research team has found that Lapwing nests are far more successful when birds nest at high densities, presumably because they work together to look out for and drive off potential predators, and they also found that Redshanks benefit from the activities of the more numerous and defensive Lapwings. Practical actions, such as clearing woodland that abuts wetland or removing single trees in which crows sit to spot the next meal, have been shown to reduce avian predation in the daytime, to such an extent, in fact, that three-quarters of nest-losses are now taking place at night. Using cameras, the team has shown that 70% of the culprits filmed taking eggs are foxes, with badgers coming a distant second, at 12%. 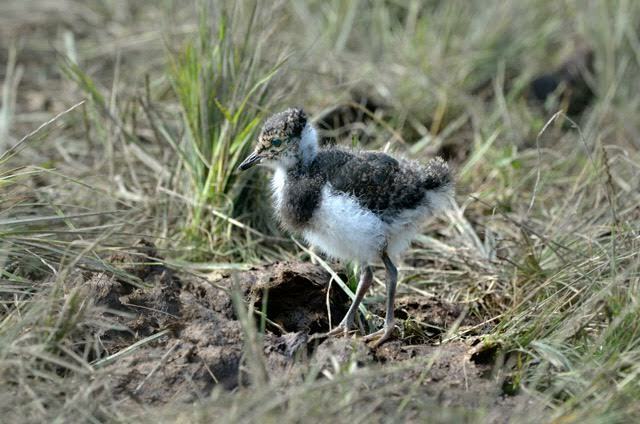 Wader chicks leave the nest soon after hatching, and RSPB research has shown that chick predation is then largely from foxes at night and raptors in the daytime, but with stoats, weasels and opportunistic birds, such as grey herons, taking smaller numbers. Overall, by far the biggest threat to productivity is the fox. One fox (and badger) deterrent that is available on nature reserves is to use well-maintained mains-supplied electric fences to surround fields in which waders nest. Trials by the RSPB have shown that Lapwing fledging success is significantly improved in fenced areas, increasing from just over 0.2 chicks per pair to 0.8 chicks. The target level for a sustainable population is 0.6 young per pair so the lower figure is well below par and 0.8 should be providing a surplus of birds that can go on to nest elsewhere. Fences are not perfect, however; they do not exclude predators such as stoats and weasels, and the increased success of nests means high densities of chicks can be an irresistible resource for opportunistic and adaptable aerial predators trying to feed their own young. Fencing is also only really effective on a relatively small scale so does not provide the solution to what is a landscape-scale problem. RSPB research has shown that there is a lot of variability in predation rates, which provides opportunities to try to understand the complex interactions between foxes, mustelids (stoats and weasels), small mammals and waders. 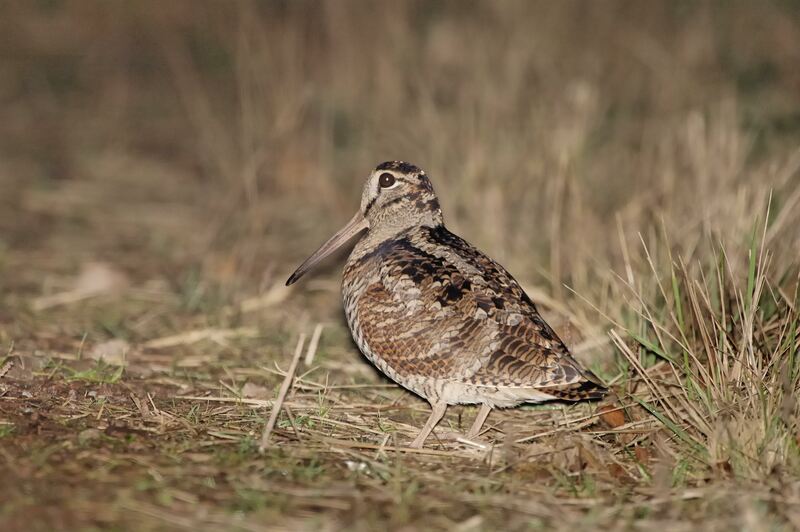 Over the last two years, the RSPB/UEA team has worked with landowners of commercial grasslands across East Anglia, who between them are responsible for a large percentage of remaining breeding wader populations. Building on the work on reserves, the aim was to understand whether habitat suitability and predation processes differ between reserve and wider countryside waders. To accomplish this, they assessed the extent to which grassland management options within agri-environment schemes support small mammal populations, as well as measuring field wetness, Lapwing densities and nest predation rates. They also assessed the importance of different nest predators for waders nesting in the wider countryside and within nature reserves. Becky and her team found similar distributions of small mammals in the wider countryside as had already been found on nature reserves. Within both, there were higher densities of small mammals within grassland habitats outside of fields, while presence within fields did not vary significantly among fields managed under different grassland agri-environment options. 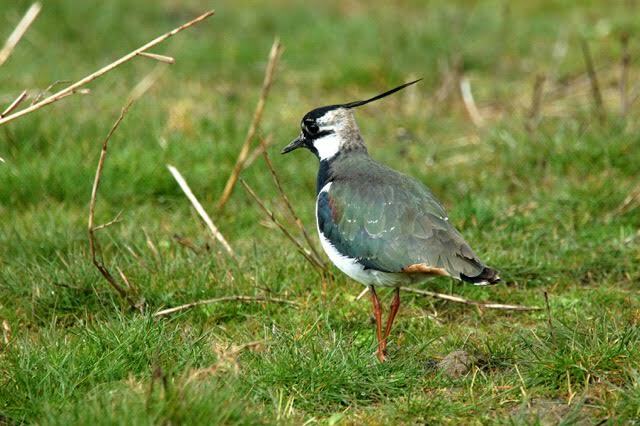 Encouragingly, densities of Lapwing nesting in fields managed in accordance with the breeding wader option were significantly higher than in fields with no interventions. Lapwings nesting in areas with many other Lapwings and nests that were closer to patches of small mammal habitat were less likely to be predated, but the rate of Lapwing nest predation did not differ between the wider countryside and reserves. It should be possible, therefore, to create Lapwing hot-spots outside of nature reserves, thereby expanding the reproductive potential of East Anglia. 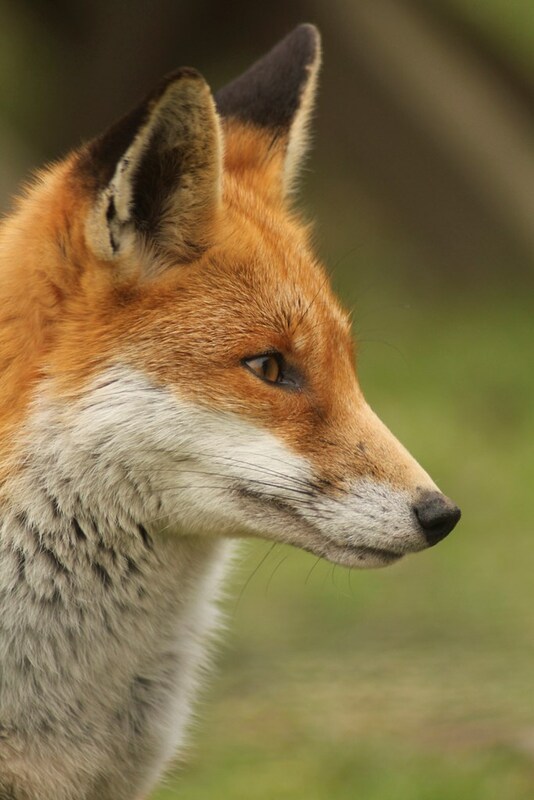 Unsurprisingly, given the previous findings about the causes of nest-losses on nature reserves, wider-countryside sites where foxes were present experienced both higher overall nest predation and nocturnal nest predation. 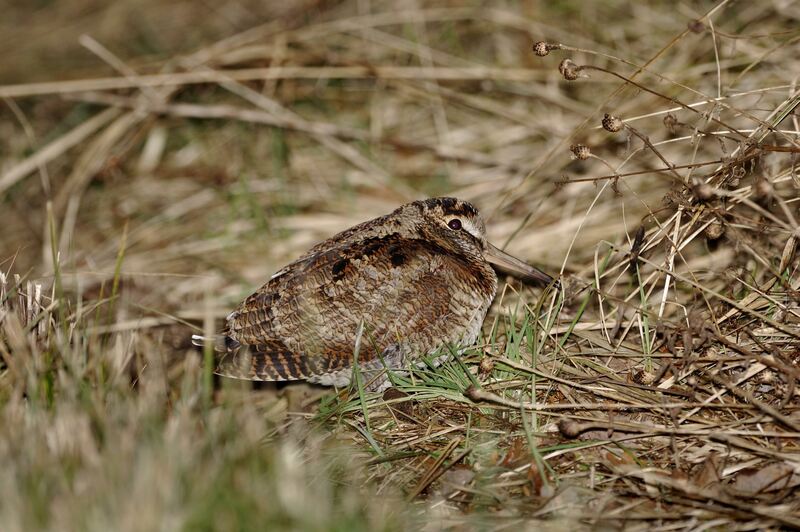 The main findings of this study are that wader nest predation rates and spatial patterns of nest predation on lowland wet grasslands are remarkably similar inside and outside reserves. 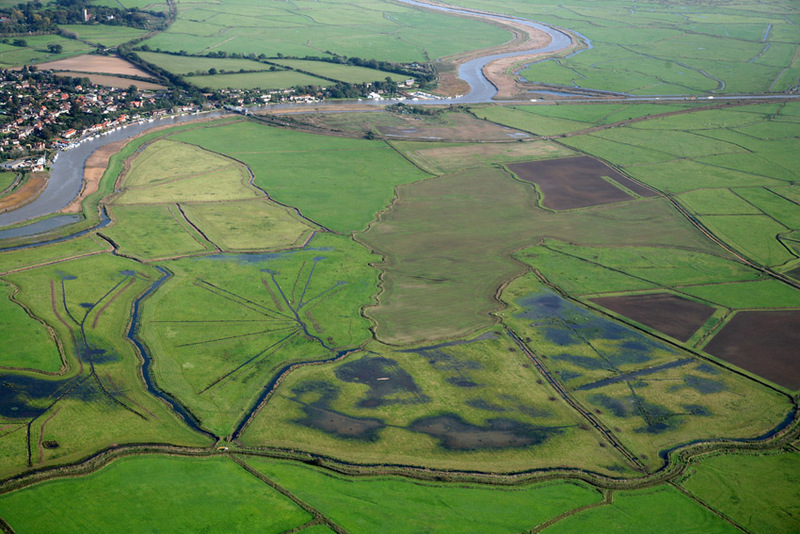 This should help to directly inform the design and development of lowland wet grassland landscapes, making them capable of attracting and supporting sustainable populations of breeding waders within the constraints of commercial grasslands. Jen Smart is optimistic; “If we can provide wet fields that look attractive to Lapwings in spring and patches of tall vegetation that hold high numbers of small mammals it ought to be possible to improve nesting success and productivity”. She and her colleagues are now looking at how a range of different agri-environment options might be used to create such landscapes. The next phase of the project will be to try out the most promising options, in order to see the scale at which these patches of tall vegetation for small mammals need to be provided if they are to deliver the desired result – more breeding waders. Tool-kit for wader conservation provides an overview of the tools that are available to conservationists and site-managers working on wet grasslands. Why do some Black-tailed Godwits wear colour-rings? The birdwatchers at Cley provide daily observations of the colour-ringed Black-tailed Godwits that turn up on the site, revealing some fascinating stories and contributing massively to migration research. This blog was originally written for the Norfolk Wildlife Trust’s magazine, Tern. No two visits to Cley are the same; the birds change with the seasons and even from day to day. If there are 200 Black-tailed Godwits in front of Daukes hide on Tuesday and only 100 on Thursday does that mean that half have moved on – or did all of the earlier birds leave, to be replaced by a new selection? 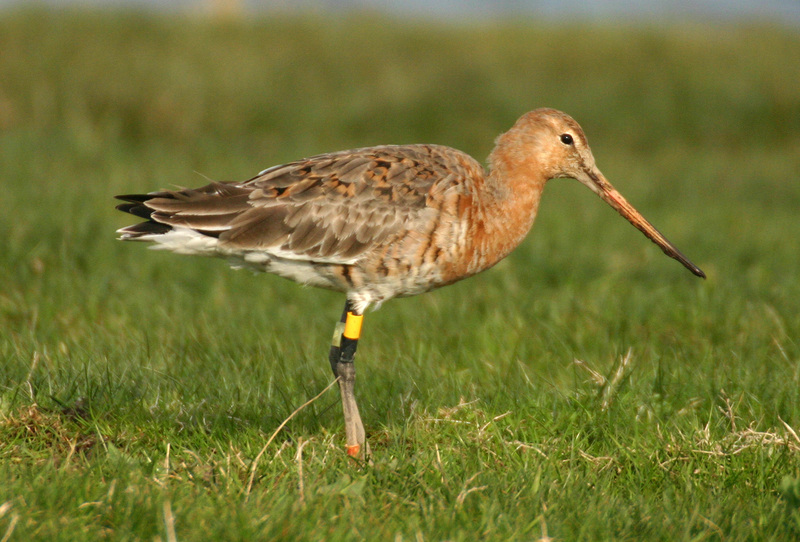 The fact that several individuals wear colour-rings enables regular godwit observers, such as David and Pat Wileman and Mark Golley, to help provide some answers. The highest Cley counts of Black-tailed Godwits now occur in the autumn, when birds can be found feeding or roosting on the scrapes and lagoons, pulling worms from the wet meadows or picking up grain from nearby stubble feeds. Many colour-ringed birds have only been seen once but others become old favourites, like ‘orange/green – orange/green-flag’. Until 2015 he spent the late summer weeks at Cley moulting out of his red summer plumage (see series of three pictures below). As autumn turned to winter, he flew onwards to the Tagus Estuary in Portugal, where he was first ringed in 2007 by José Alves, one of a team investigating migration at the Universities of East Anglia, Iceland and Aveiro (Portugal). Another well-watched bird is ‘lime – yellow/black//white’. She was first caught on the Wash in September 2002 and has spent every March/April at Cley or Stiffkey. She has been seen in Ireland in mid-winter and nests in northern Iceland. This bird was already an adult when ringed 12 years ago so her exact age is unknown. The current record for Icelandic Black-tailed Godwits is 25 years but colour-ringing is likely to show that they can live even longer. Whilst the vast majority of Cley Black-tailed Godwits are of the Icelandic race, a few birds from the small population of birds that breed in the Ouse and Nene Washes also pass through in the autumn. Later they will join thousands of birds from continental Europe, wintering in Iberia and west Africa. The Icelandic colour-ringed birds are providing fascinating insights into the migratory movements of that subspecies, the numbers of which have risen at the same time as the numbers of the continental subspecies have declined. Icelandic birds winter all around western Europe; Cley birds have been seen in France, Portugal, Spain and Ireland, as well as around much of the UK. Rates of population increase were greater on estuaries with low initial numbers, and Black-tailed Godwits on these sites had lower prey-intake rates, lower survival rates and arrived later in Iceland than those on sites with stable populations. The Buffer effect and large-scale population regulation in migratory birds. JA Gill, K Norris, TG Gunnarsson, PW Atkinson & WJ Sutherland. Nature 412, 436-438 (26 July 2001). We know that birds from the same pair have nothing to do with each other outside the breeding season, even wintering in different countries, but that they need to arrive on territory within a day or two of each other if there is not to be a divorce. Pair Bonds: Arrival synchrony in migratory shorebirds. TG Gunnarsson, JA Gill, T Sigurbjörnsson & WJ Sutherland. Nature 431, 646 (7 October 2004). There’s a WaderTales blog about this paper. We have learnt that spring migration is getting earlier, driven by new recruits getting back to Iceland earlier than older birds. Why is timing of migration advancing when individuals are not? Jennifer A. Gill, José A. Alves, William J. Sutherland, Graham F. Appleton, Peter M. Potts, Tómas G. Gunnarsson. Proceedings of The Royal Society B 281 (13 November 2013). There’s a WaderTales blog about this paper. This blog tells more stories about individual Black-tailed Godwits and the birdwatchers who study them: Godwits and Godwiteers. There are many more WaderTales blogs about Black-tailed Godwits. Click here to see what is available. Cley is a great place to see godwits at really close quarters, as are a number of other nature reserves around the country. Reports of colour-ringed birds provide an important element of ongoing migration research. Please contact Jenny Gill at j.gill@uea.ac.uk and you will receive a life-history of your bird, either from Jenny or from one of her collaborators. Most waders leave Iceland in the autumn, with vast numbers heading for the British Isles, coastal Europe and even Africa. Amongst the exceptions are hundreds of Oystercatchers which ‘tough it out’ in wintry conditions, thereby saving themselves two long trans-Atlantic flights and potentially ensuring that they are able to make a prompt start to the next breeding season. 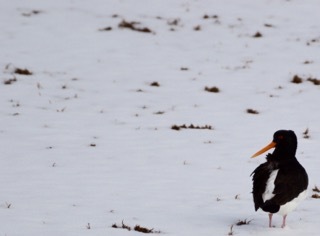 Why do some Oystercatchers migrate when others don’t? Is it the same birds each year? Do resident birds have a competitive advantage when it comes to choosing a territory and raising chicks, and do these chicks follow the same migratory strategy as their parents? In an era of changing weather patterns, can birds change their migratory preferences and how does this happen? These are some of the questions that are being tackled by Verónica Méndez, as she monitors the movements of colour-ringed individuals in a joint University of East Anglia (UK) / University of Iceland / University of Aveiro (Portugal) project. Throughout the world, the distribution, abundance and behaviour of species is changing, partially as a response to climatic change. Given that most bird protection relies on a legislative framework that is site-based, changes to bird distributions are going to make life challenging for conservationists. Will today’s Special Protection Areas be fit for purpose in 20 years’ time? As they look to the future, conservationists want to be able to set up a network of sites that can flexibly support migratory species, and this entails understanding why and how migratory patterns are changing and might change in the future. Icelandic Oystercatchers may well provide an ideal model species through which scientists can learn how migratory decisions can influence individual fitness, population demography and species distribution. There are likely to be different pressures facing resident and migratory Oystercatchers. Two birds that breed on adjacent territories might have completely different annual cycles. The bird that spends the winter in Iceland will not have to migrate but its probability of survival may be reduced by harsher winter conditions, possibly with a more limited set of feeding options and certainly with shorter periods of daylight. In mid-winter, there is 6hr 40 min between first light and dusk in Reykjavik but 9 hours in Bangor, North Wales. Come the spring, however, the same bird will be well placed to take advantage if spring comes early, whilst his migratory neighbour will face a hazardous sea-crossing, perhaps being delayed by a fortnight or more if strong northerly winds set in. Although patterns of change in migratory strategies can be detected by looking at timings of first arrival and counting flocks, these changes can only be explained if we understand what individuals are doing. It will be interesting to see, for instance, if Icelandic-winterers pair up together and what their offspring subsequently do in their first autumn. 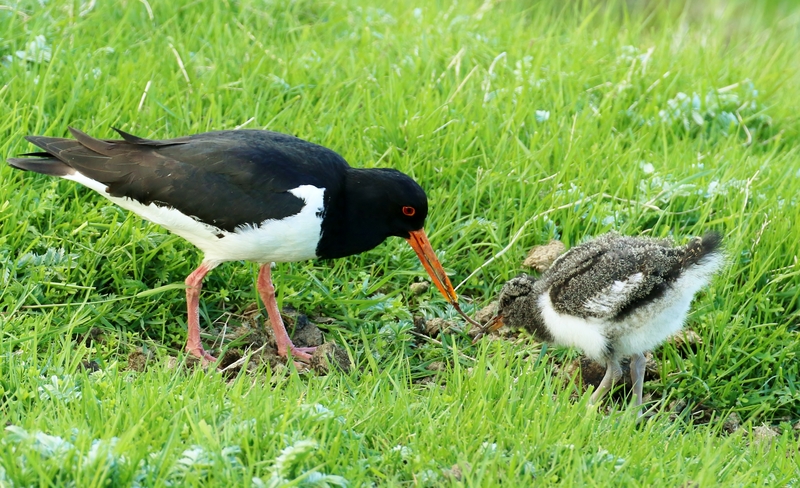 Oystercatchers look after their chicks for longer than most waders so perhaps youngsters will be more likely to adopt the strategy of their parents than other species? 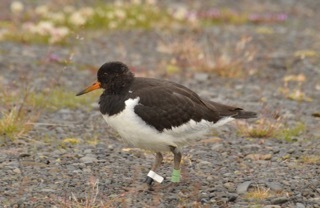 To answer these and many other questions, Verónica and colleagues from the Universities of East Anglia, Iceland and Aveiro have been colour-ringing Oystercatcher adults and chicks on the breeding grounds between the north-west and southern lowlands of Iceland. Both adults and chicks (when big enough) are ringed with two colour rings on the left tarsus and a flag above another colour ring on the right tarsus (metal ring goes on either tibia and is not part of the scheme). See update below to learn about a second scheme. The study season for an Oystercatcher fieldworker starts in April, when the first nests start to appear. Once a full clutch of between 1 and 4 eggs has been produced, both parent birds take turns to incubate for between 3 and 4 weeks. During this period it is possible to catch the adults by temporarily replacing the eggs with plastic eggs and setting a spring trap or walk-in trap over the nest. Sometimes the second adult can be caught while the first bird is being ringed, as he or she settles down on the unattended eggs. Catching chicks is harder. Although they can be metal-ringed at an early age, their legs are too short at this stage for additional colour-rings. By the time that the youngsters are big enough they can run very quickly – or even fly – providing excellent entertainment for the ‘spotter’ in the research team, as the ‘chaser’ is often outwitted and out-run. What has been learnt so far? 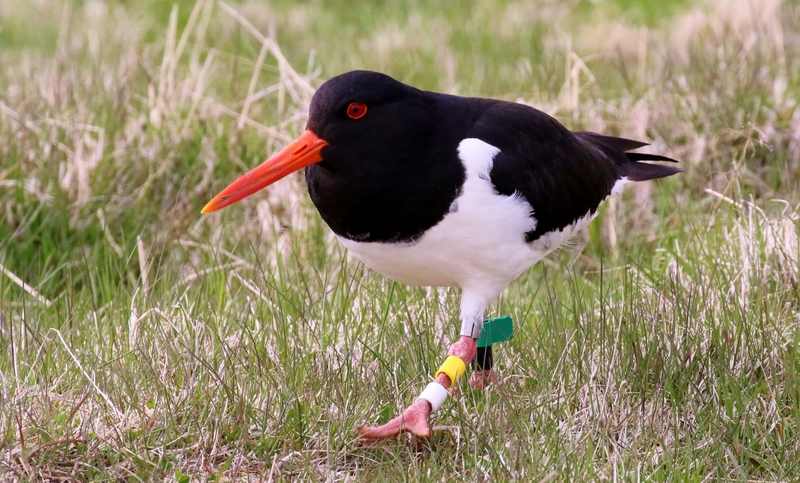 The first adult Oystercatchers were colour-marked in the summer of 2012 and more were ringed in 2013 and 2014. In the winter of 2014-15, eight migratory individuals were seen in Ireland, Northern Ireland, Wales, Scotland and Shetland and five resident birds were shown to have stayed in Iceland. Additionally, five birds wearing BTO rings that they acquired in Ireland and Wales have been recruited to the colour-ring project, increasing the sample of known migrants. By the end of 2015, over 200 adults had been colour-ringed, as well as about 100 new chicks, so there should be plenty of birds to look for this winter. A century or more of metal-ringing has shown that Icelandic Oystercatchers migrate mostly to the British Isles and West coast of France, but some have been recovered in Germany, The Netherlands, Spain and Portugal, so please check out any Oystercatcher flocks you see in any of these countries. Although most observations of colour-ringed Oystercatchers will be made during the winter months, young birds may well be spotted in the summer, as Oystercatchers do not start to breed until they are two or more years old. If some juveniles winter in Iceland perhaps they might be able to breed at a younger age than their migratory cousins? That would be yet another way for a change in strategy to not only impact on the fitness of the individual but also on the population demography and the overall migratory strategy of the species. 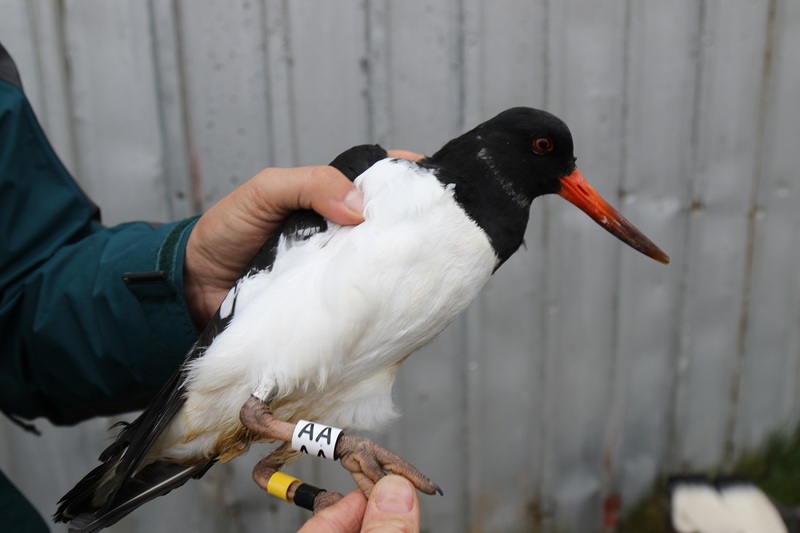 Oystercatchers caught in later catches have been ringed with white, grey or green engraved rings, alongside two colour-rings. If you come across a bird with a yellow engraved ring then it is probably from a project in Dublin Bay. When researchers from the two projects got together at the 2015 International Wader Study Group Conference in Iceland they realised that five more Dublin Bay birds could be added to the list of Icelandic breeders that are definite migrants.